Hairdreams® Hair Extensions: Look Awesome With Our Hair Extensions! Are you searching for beautiful hair extensions that look just as awesome as your real hair? 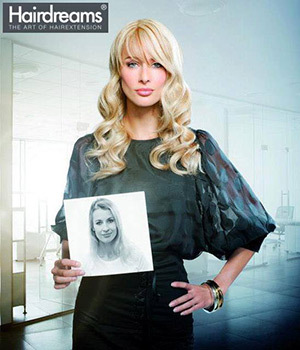 At Ozlem Hair and Spa, we’re proud to offer Hairdreams® hair extensions! Hairdreams® hair extensions use a Laserbeamer Nano to seamlessly blend your own natural hair with our 100 percent real human hair extensions. No more glue, weave, heat bonding, or pesky clip-in combs. You can enjoy long, luscious hair that looks completely natural with Hairdreams® hair extensions! We all wish that we could enjoy thicker, fuller hair. Whatever type of hair you have, you can customize your Hairdreams hair extensions to your personal style and look awesome! You’ll be able to style your hair extensions just like you would your normal hair, and no more washing, drying, or curling your hair extensions! You’ll be able to wear your hair in a ponytail, elegant updos, and trendy styles without worrying about a comb coming loose or your tapes being visible. The Laserbeamer Nano makes the extension lie perfectly flat against your head, making it virtually undetectable. You’ll get to enjoy gorgeous, thick hair that looks completely natural! You won’t have to spend hours carefully washing, drying, and styling your clip-in hair extensions. Because we use only 100 percent real human hair, you can use your favorite shampoo, conditioner, and other styling products. You can also enjoy trimming them or trying new styles because our Hairdreams hair extensions look so natural and can be cut. Instead of worrying about heat damaging your artificial extensions, you can curl and straighten your hair just like you normally would! Depending on how much hair you have and would like, you can be in and out of our salon in an hour or less! Gone are the days where you would spend all day in the salon, waiting hours to have your extensions sewn, glued, or heat bonded into your hair. You can enjoy our Laserbeamer Nano technology and you’ll be done in no time and can enjoy your beautiful new hair. Contact Ozlem Hair and Spa in Johns Creek today for more information and to get started on your Hairdreams hair extensions journey today!